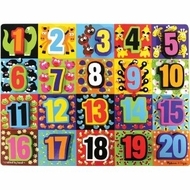 This hand-painted, playfully styled Jumbo Numbers puzzle is sure to capture and keep the attention of curious young minds. The thick, chunky wooden puzzle pieces fit neatly into their spots on the colorful board and also stand up for additional pretend play. Puzzle features full-color images beneath each piece to guide little ones.